Anyone familiar with the Wirral Peninsular and the iconic views of the Liverpool skyline will relate to the mystic allure of the mighty River Mersey. An ever changing mural of activity that has shaped this great city and surrounding areas for many centuries. People can relate to the city and the river for many diverse reasons. For a select few however, the river itself has provoked a certain desire since the first recorded successful swim across the Mersey in 1863 and swimmers from every generation since have faced the same challenge against an ever changing tide of bureaucracy. The first recorded ‘Across Mersey Swim’ was organised by John Hulley (The Forgotten Man of British Olympic History) as part of the Grand Liverpool Olympic Festival in 1863. The swim attracted nine swimmers, with thousands of spectators watching the swim from both sides of the river. 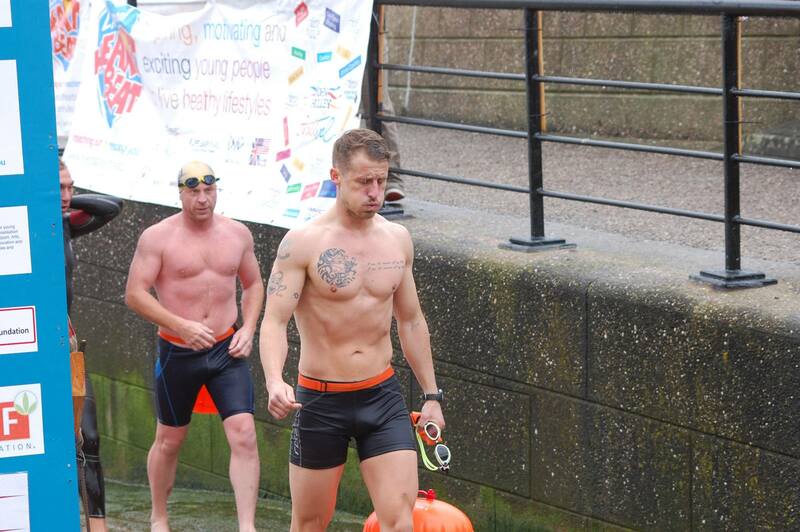 Only two managed to finish, had swum over five miles and were in the water for nearly two hours. The ‘Across Mersey Swim’ and the Grand National were the top two major events in Liverpool that year and attracted thousands of spectators at both events. 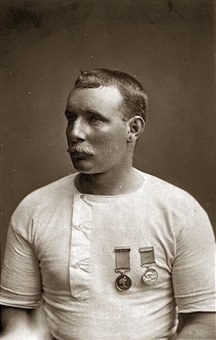 Captain Webb first swam across the Mersey in 1876 – the year after he became the first person to swim the English Channel solo. The swim then became an annual event for the next 62 years and was only stopped with the advent of WWII in 1938. 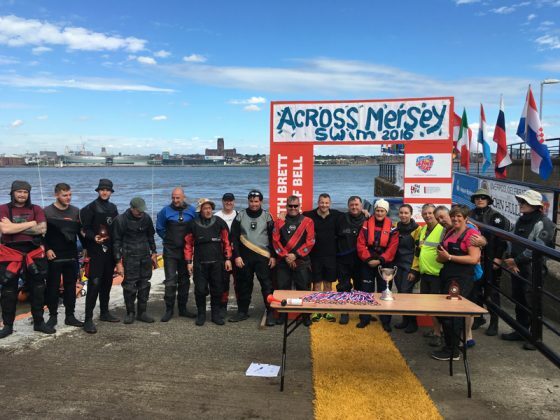 It was following this period that local swimming legend Jimmy Tinsley became the first person on Merseyside to successfully swim the English Channel in 1987, and swimmers from both sides of the river began looking to renew the tradition of the ‘Across Mersey Swim’. Merseyside Police for many years swam with the tide from Seacombe to New Brighton. 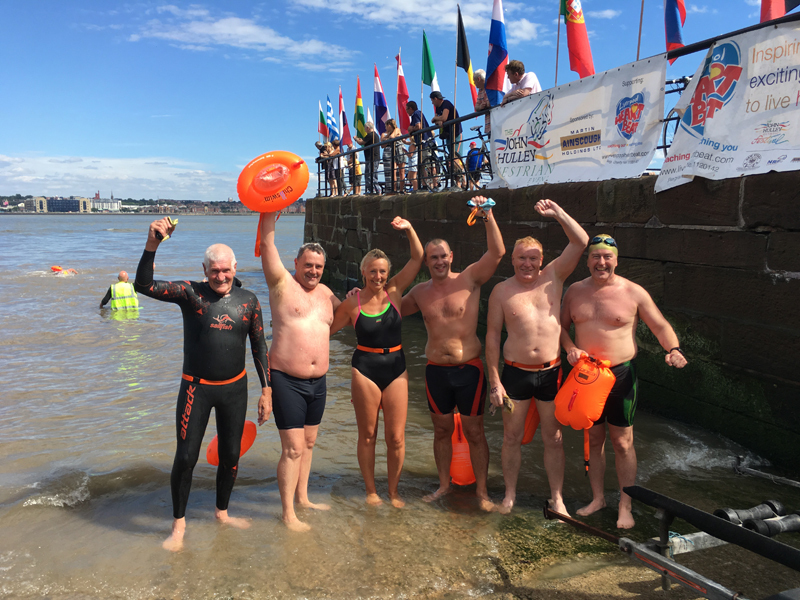 The post war ‘Across Mersey Swim’ was started in 1994 by Jimmy Tinsley, Bob Jones and Robin Baynes following their successful English Channel Relay Swim, as members of the City of Liverpool Swimming Club (Cold Water Section). Both swims were in memory of Barbara Marshall (Robin’s sister in law) raising £35,000 for the Royal Liverpool University Hospital (RLUH) ‘Forget me not Cancer Appeal’. In the first year, the swim was started on a low tide with all swimmers ending up in Garston Docks, swimming seven and a half miles instead of the anticipated one and half miles from Rock Park to Britannia Pub. In 1997, the swim was supported by The King and Queen of the Channel, Mike Read and Allison Streeter, who have swam the English Channel successfully over 50 times between them. 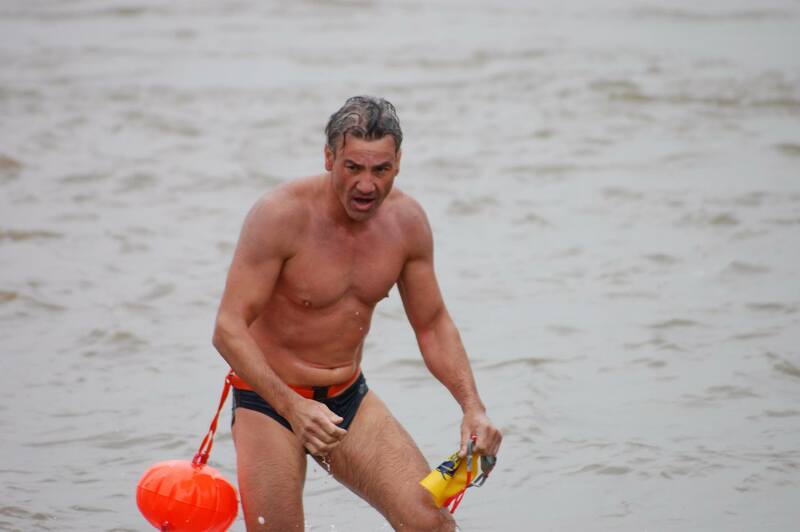 Unfortunately, the swim was cancelled at the last minute due to the atrocious weather conditions. 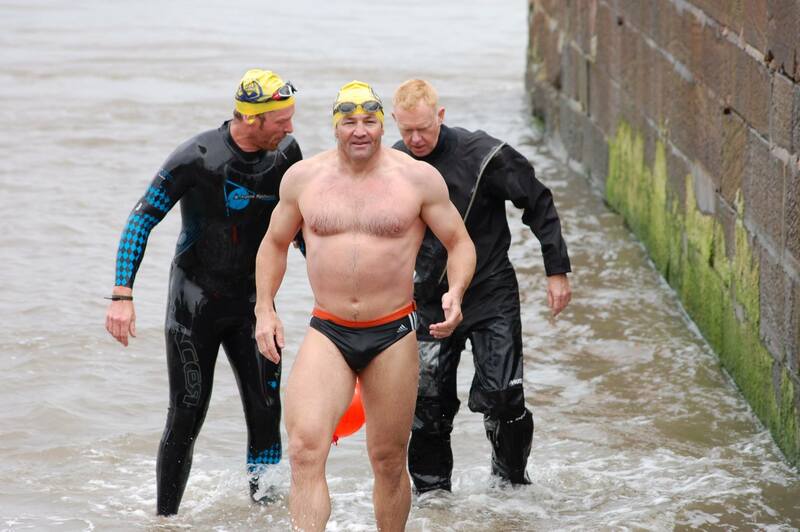 An alternative swim of three laps of the Albert Dock was organised by Jimmy Tinsley from City of Liverpool SC. The winner that year was Graeme Gunn from Northern Ireland. 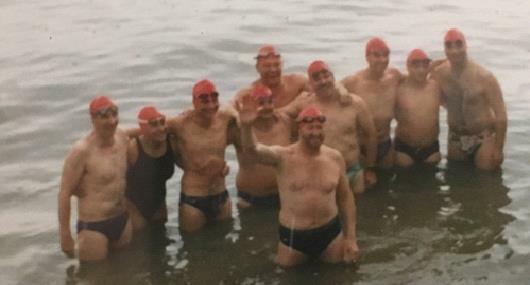 The following year Robin Baynes, Jimmy Tinsley and Bob Jones were invited to a meeting with North West Water (NWW), who provided sponsorship for the swim for the following three years. 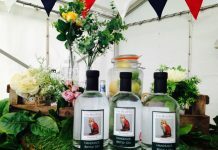 The monies raised were divided equally between BMMF and Water Aid, the Charity NWW support. Due to this success, NWW continued funding the swim for six years until 1999 with many swimmers raising tens of thousands of pounds for the charities they supported by swimming the mighty Mersey. The 1998 and 1999 swim was won by Liverpool swimmer Dave Parry, brother of olympic swimmer Steve Parry. In the year 2000, the River Mersey Basin sponsored the swim. The River Mersey was now getting world wide acclaim for being a clean river attracting an abundance of wildlife with fish, seals, birds and even six small octopus’ being released into the river. Press cuttings, videos and photographs of previous year’s swims were sent to the Director of The River Basin Campaign who presented a lecture in Brisbane Australia, as the Australians did not believe the Mersey was clean enough to swim. In 2000, Jimmy Tinsley was runner up to Dave Reason from Howebridge Marlins, Bolton. The 2001 swim was cancelled in memory of Kenny O’Toole who died suddenly from heart failure (1946-2001). 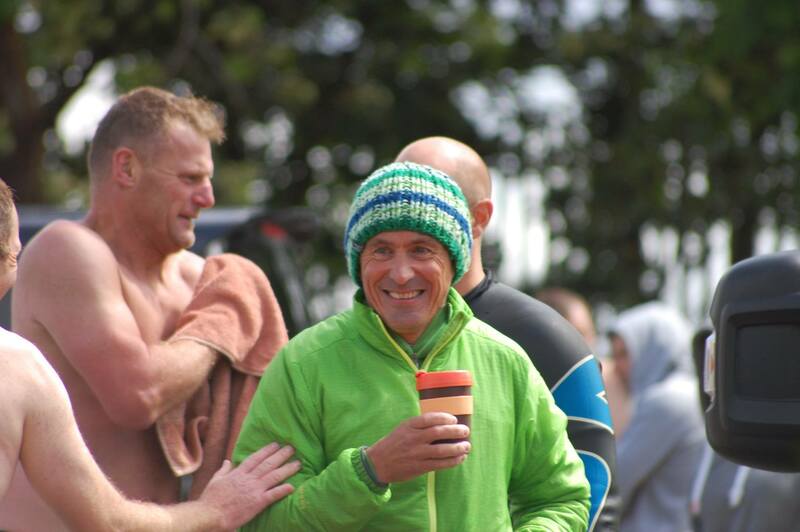 Kenny had been part of the six man English Channel Relay Swim Team and had also swam the Mersey many times, finishing third one year. 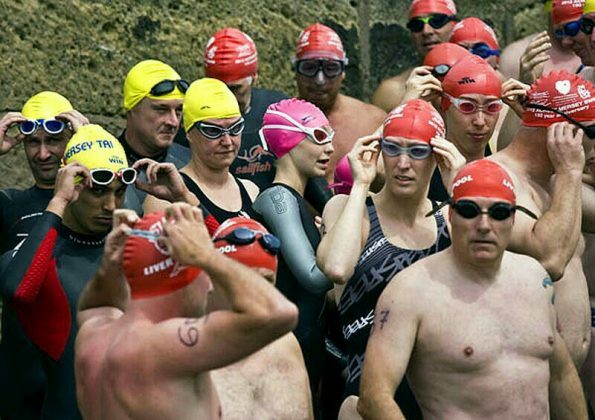 With many stories of epic swims, individual challenges and a growing legacy, the swim became a self funded event from 2002 now relying on swim entry fees to support the event. 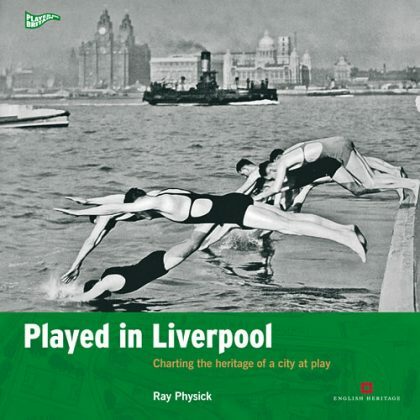 In 2001, Robin was asked to write an article on the Post War Across River Mersey Swim for a book called ‘Played in Liverpool’ by Ray Physick. The front cover showed the start of the 1937 Across Mersey Swim, with swimmers diving in to the River Mersey from the side of a boat called the Skirmisher. 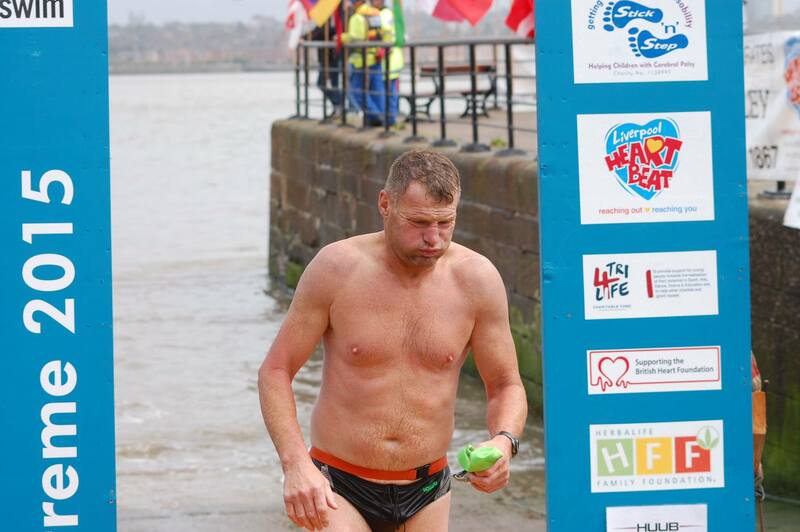 In 2002, Robin Baynes founded the charity Liverpool Heartbeat and provided a new trophy for the Across Mersey Swim in memory of Kenny ‘Dipper’ O’Toole. The first swimmer to have his name on the new Trophy was Neville Barton. 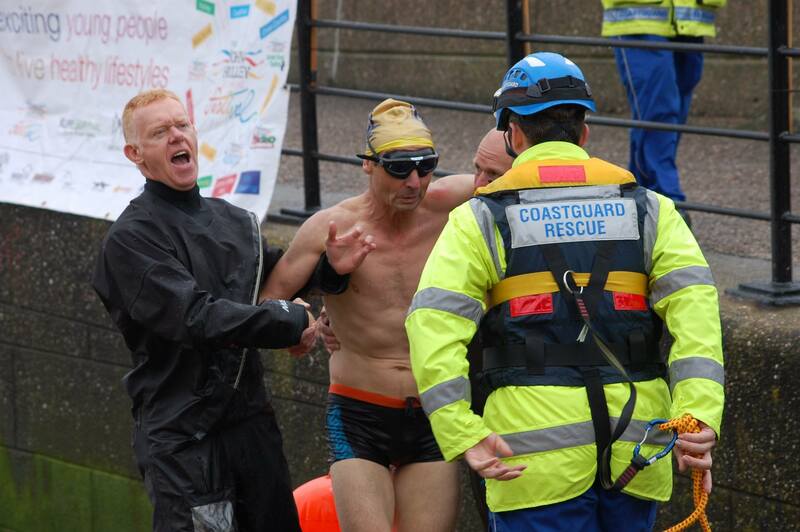 It was during an open water swimming session at the salt house dock in 2002 that I first learnt about this iconic swim and met Jim Tinsley for the first time. 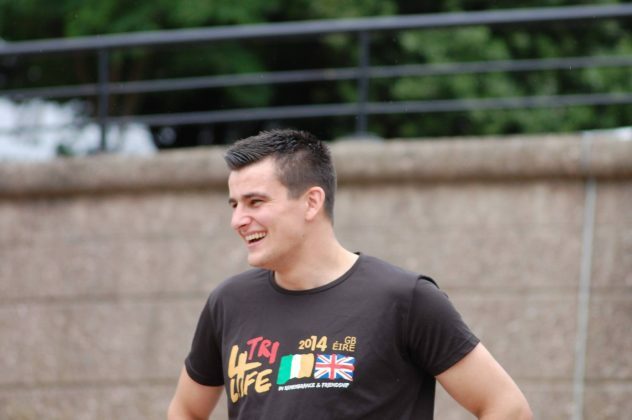 The newly formed tri-4-life team were preparing for their 2006 European Challenge that would include two seven man English Channel relay teams. From that introduction Robin Baynes, Jimmy Tinsley and Bob Jones became lifelong friends, supporters and tri-4-life team members. The 2003 Across Mersey swim saw the 14 members of the tri-4-life team attempt the crossing for the second time with three generations of the Hanlon family taking to the water, with the young Ryan Hanlon, 14, being hauled out after forty minutes due to hypothermia. The winner of the swim was Richard Kay. 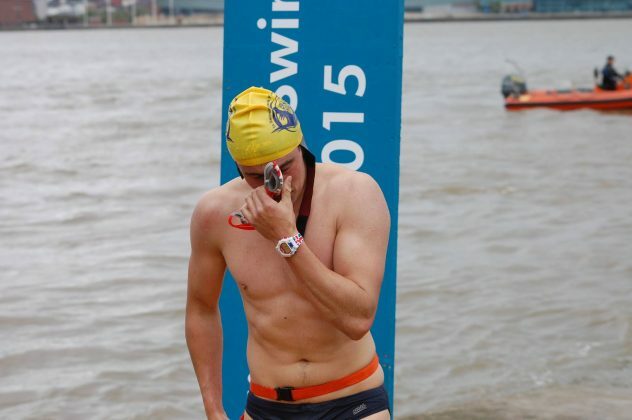 In 2004, another young swimmer, Mike Searle, 17, won the Across Mersey Swim in a record time of (17 minutes 22 seconds) – a record that still stands today. 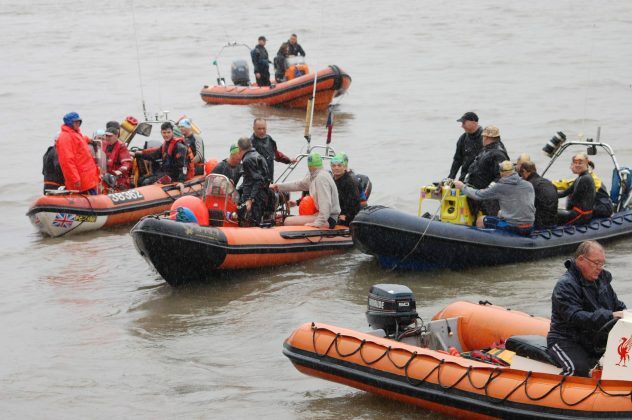 In 2005, the swim was cancelled due to Power Boat Racing on the River Mersey taking place on the same day, so an alternative swim was arranged from Seacombe to New Brighton. The City of Liverpool swimming club also featured with its first junior channel relay team. Steve Wall was the winner that year. The 2006 Swim was cancelled through lack of safety cover. 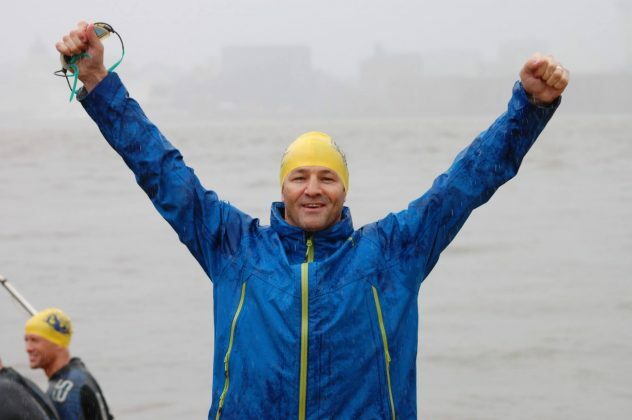 In the following three years 2007, 2008 & 2009, the swim was won by Matt Webster, and following his third year of winning the Across Mersey Swim, Matt received a special award in recognition of his three wins. Nicholas Robinson was the first to swim using the butterfly stroke in 2007 and two years later, Joe Coy also did the same. 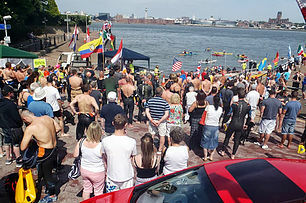 With the continued success of the swim, Liverpool Heartbeat, tri-4-life, City of Liverpool swimming club and Merseytri with the support of all Merseyside dive clubs, canoe clubs and local Mersey fisherman boats were coming under increased bureaucratic pressures from the local council and port authorities that wanted increased documentation and insurances to legitimise the swim as an ‘event’. By the very nature and adventure aspect of the swim this would always prove difficult. As a volunteer extreme and adventure event organiser, it was always my intention to keep the swim open and accessible to as many deserving participants as possible. 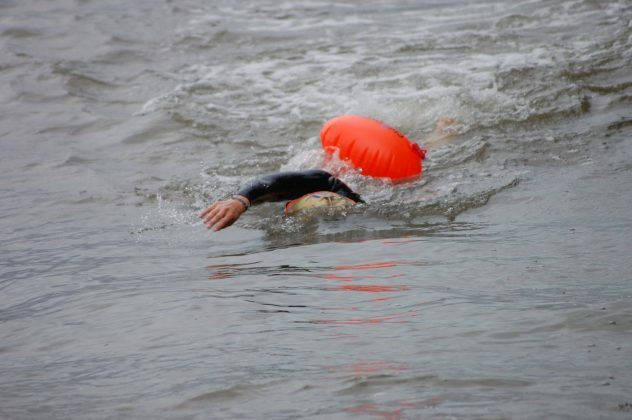 Whilst every precaution and consideration for safety would be given, the element of risk would always remain an attraction and challenge of the swim, with swimmers raising funds for their chosen charity instead of the numerous invented commercial enterprises looking for profit. In order to meet National Governing Body requirements for insurance cover, a run was added at the end of the 2010 and 2011 swims to form ‘The John Hulley Across Mersey Aquathlon’. The trophy was donated by Liverpool Heartbeat Charity. The winner of both 2010 and 2011 events was a young Spanish boy, Jullio Novarro Lopez, who at the time was attending Liverpool College studying English. Permission was sought from his guardians and college for him to enter the event. 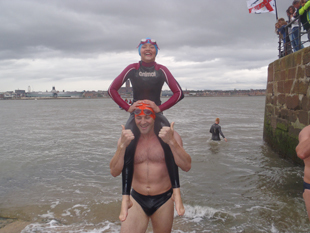 With a growing junior interest in the Across Mersey Swim, 2011 again saw three generations of the Hanlon family take to the waves. 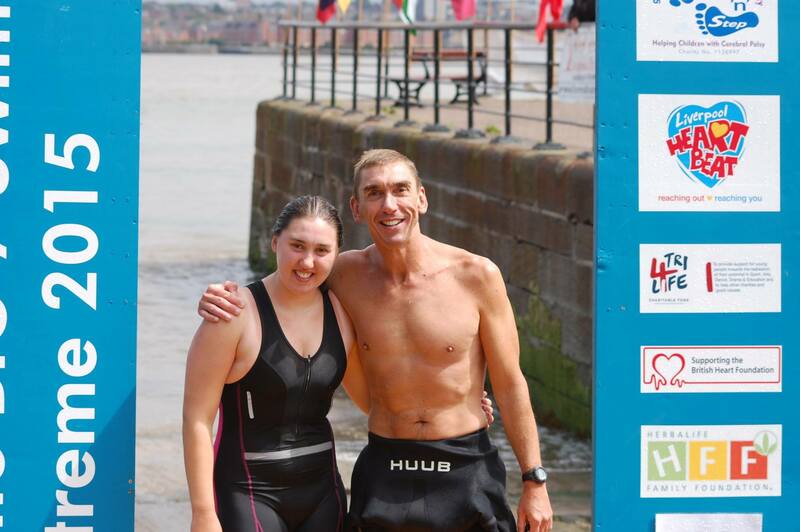 It was a proud day for me to swim alongside my dad, uncle, brothers, cousins, friends and my daughters, Kiera Rose, 13, and her younger sister Caitlin Rae, 11, became the youngest ever swimmer to successfully swim the mighty Mersey. This achievement overshadowed some other great performances that day, including the youngest male swimmer to make a successful crossing, 14 years old Tom Roberts. In 2012, the year that saw London host the Olympic Games, Liverpool Heartbeat hosted the John Hulley Liverpool Olympic Festival, involving over 30 sporting events for young people, including the Across Mersey Swim. The winner in 2012 was Gary Munsey. 2013 saw the highest number of entries; with 86 carefully selected swimmers start the swim, and 84 reaching the finish – making it the most successful swim in its history. 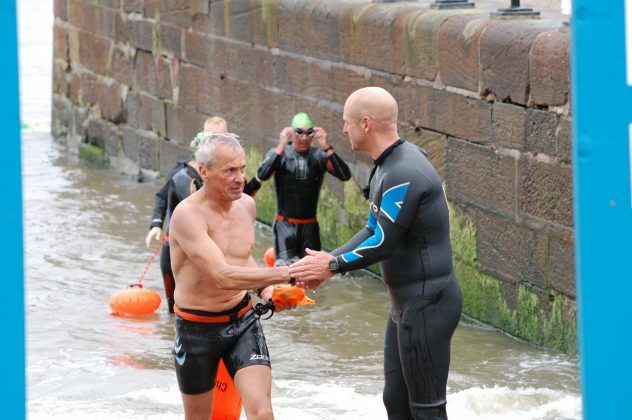 The Across Mersey Swim was won by Alan Wolfarth for the second time. 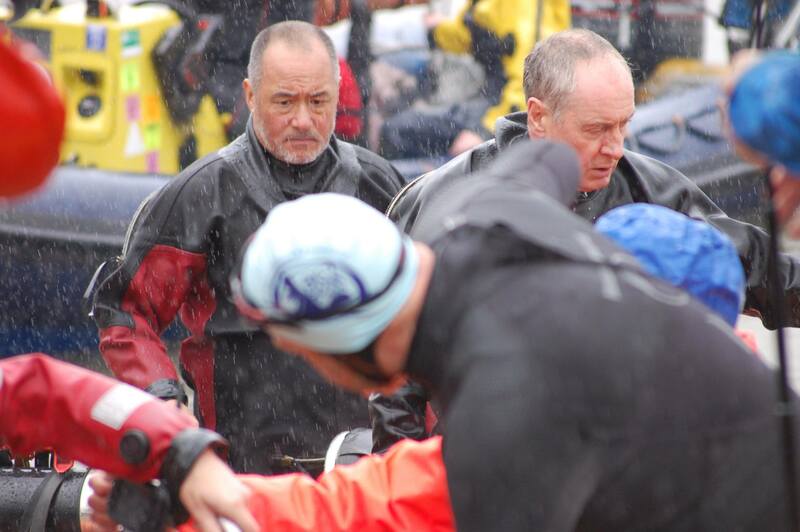 Alan’s other win was in 2011 but he did not complete the Aquathlon and swimmer Joe Kerrigann, 77, became the oldest swimmer to complete the crossing. We also had a number of disabled swimmers successfully completing the swim. The tri-4-life team also featured again in 2013 in preparation for their upcoming Arch to Arc challenge. This time with a single six man Channel relay team. 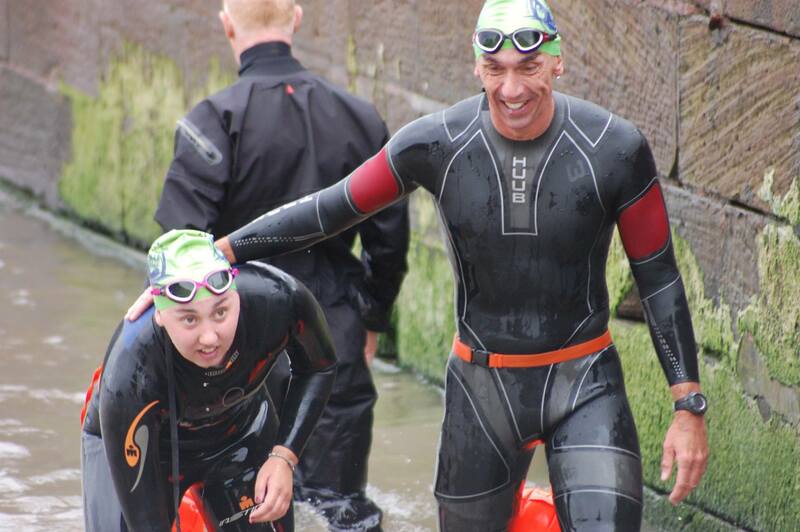 The swim was also taking on a real family feeling with a number of father & son and dad & daughter combinations. Brian & Charlotte Henners, Dave & Georgia Roberts, Dave & Phil Walton, Paul & John Thelwell and an array of Hanlon family combinations. The swim was cancelled in 2014 due to lack of safety cover. 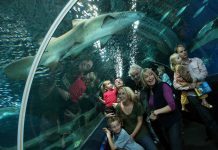 Pressure from Liverpool City Council and changes to its Health and Safety Policy created changes that would impact the future format of the swim. 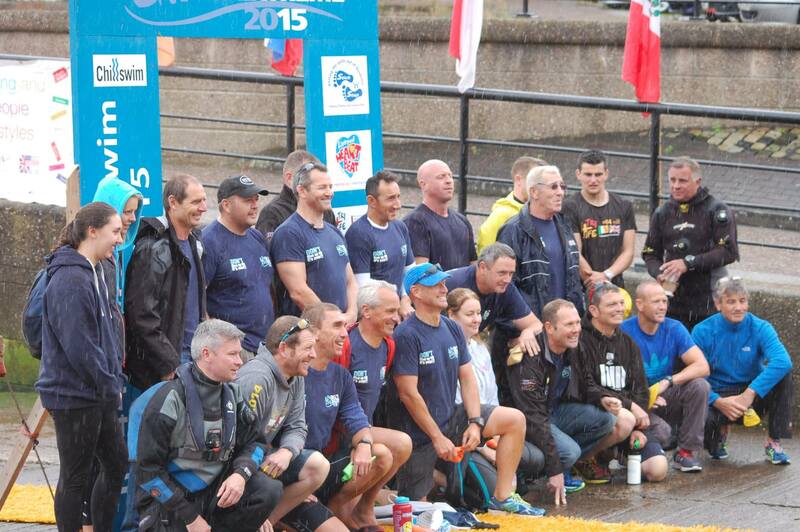 An alternative swim was arranged in the Queens Dock for 2014. 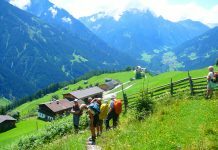 The voluntary attendance we had enjoyed from the canoeing community were prevented from taking part by their National Governing Body ruling, who stated that the insurance cover of any volunteer supporting the swim would be deemed invalid. 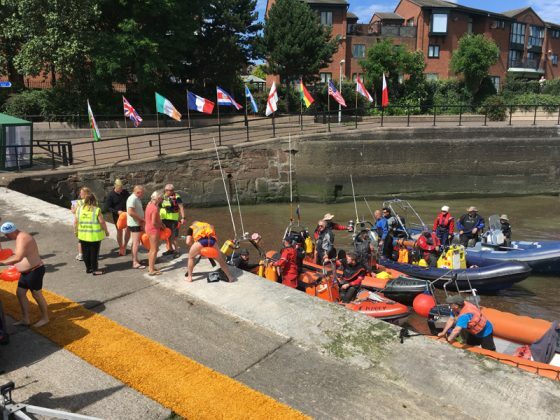 Without the canoe clubs to help with safety cover, the 2015 Across Mersey Swim was re-formatted to be swum in pods, supported by Kevin Gerrard and the RHIB crews of the Diving Clubs of Liverpool, Ormskirk, Southport and Shrewsbury. 5 pods, with 6 swimmers of equal ability in each pod. Different coloured swim hats were worn to distinguish the pods from one another. 2015 also saw the Across Mersey Swim included as a major section of the BBC 1 documentary SEA CITIES Liverpool. This presented a real insight into the challenges and factors that affect the swim, the motivation and mind-set of the swimmers and why the mighty Mersey remains an unpredictable swimming enigma. 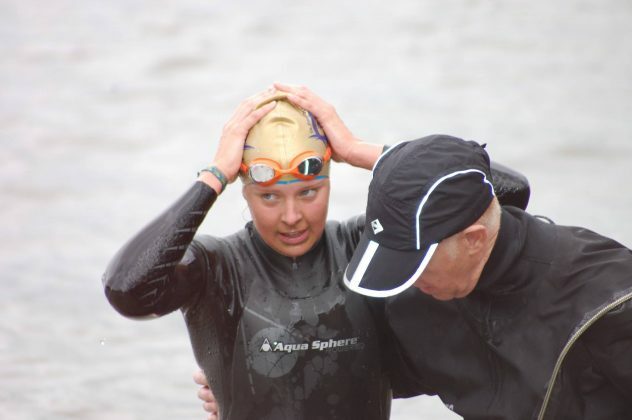 Top female swimmer Zoe Brunton was first to reach Monks Ferry, whilst others were stung by sea bees, suffered hypothermia and caught on the wrong side of the Mersey’s unforgiving tide. Mersey swimming legend Dave Sandman holds the record for the most crossings, having swam ‘The Across Mersey Swim’ 14 times and has been an avid fundraiser swimming for many charities including, Liverpool Heartbeat, Water Aid, New Born Appeal and The British Heart Foundation. And so… as this new chapter of ‘The Across Mersey Swim’ journeys towards its 25th Anniversary creating its own place in our sporting culture and history, Liam Hanlon, Jim Tinsley, Robin Baynes & Bob Jones together with all the supporting elements and safety cover required for a successful swim, will continue to wave the flag and seek support from all parties responsible for the access and safe use of our River to create a legacy for the now infamous ‘Across Mersey Swim’ for generations to come. Since 1863, the mighty Mersey tide has continued to ebb and flow, and swimmers have continued to gaze across the grey waters in awe of this iconic challenge that is The Across Mersey Swim. 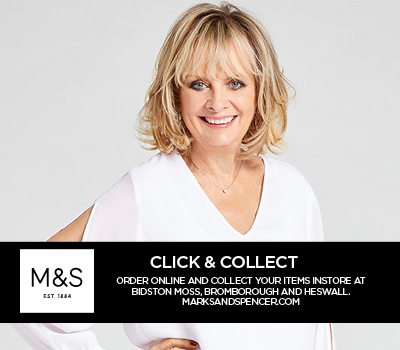 For further information, contact Liam Hanlon 07966 529133. *Please note that individuals should not attempt to swim the Mersey as it can be dangerous. If you would like to take part in an organised and safe swim, please call Liam.